Businesses of all types are increasingly finding themselves in midst of a high performance computing (HPC) environment. This commercial HPC environment though is different from traditional HPC environments found in academia. The demand for business to manage their own HPC environment became apparent over the past few years as organizations learned the value of mining their data to help make better decisions, develop better products and to even monetize their data assets. It’s not uncommon for these commercial HPC customers to first attempt to use traditional business class storage systems designed for databases and virtual machines. They quickly find however that the sequential access of mass quantities of large and small files is beyond the capabilities of these systems. The commercial HPC customer then turns to traditional HPC architectures common in academia. The problem with traditional HPC architectures is they require a lot of time and assembly to implement and maintain. Instead, Commercial HPC needs something different, a turnkey system that handles the unique Commercial HPC IO patterns while using storage resources optimally so costs stay in check. 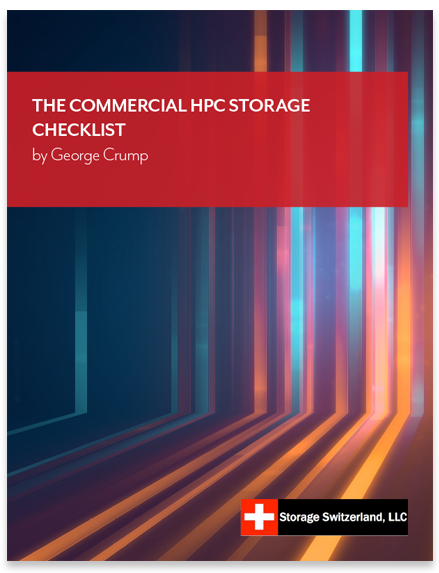 In our latest eBook, Storage Switzerland and Panasas provide a checklist of what organizations should look for in an HPC storage system designed for the commercial market.